The two Mercy colleges in Wellington scooped the two top prizes in the O’Shea Shield competition run in the first weekend of May at Francis Douglas Memorial College, New Plymouth. St Mary’s won the shield and St Catherine’s won the Viard Cup. 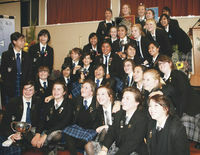 St Patrick’s College, Silverstream, was third. The programme started with 18 teams, including New Plymouth Girls High School to make up the numbers, debating the moot ‘That humanity is moving toward a more just global society’. The Shield provides the only occasion in the school year when all 17 colleges in the two dioceses come together. It is a tough contest, at least as fierce as a well-fought rugby match. Part of Catholic tradition is educating young men and women to have a presence in society. Education was seen as multi-faceted with the academic stream alongside the sporting and then there was the challenge to be able to speak in public and communicate to a larger audience. Being able to present oneself well and coherently in public is seen as an important part of Catholic education.People like the region’s early bishops Viard, Redwood and O’Shea knew how to make their presence felt in the halls of power. One teacher said it was great to see young people in an arena in which they do not often appear and to see how they think about and argue wider issues. For example, the debate’s moot really requires an understanding of international politics and the wheeling and dealing that goes on in global relations. In terms of theology and Catholicism, young people are, through their preparation for this competition, probing the sorts of documents that a priest would be required to explain in the past and re-presenting them in their own words. Young people are really probing the essence of such central beliefs as faith hope and love. It is a wonderful opportunity for young people and many who have signed up for O’Shea in Year 13 have regretted not taking part in the competition earlier in their school life. O’Shea started 65 years ago when a group of Catholic leaders approached Archbishop O’Shea and suggested such a competition, and he donated the Shield. See pages 10 and 11 for more photos.